Beyonce has always been a strong supporter of President Barack Obama. She and her husband Jay Z have campaigned more for him than any other celebrity in Hip Hop culture has. It's only right that she not only campaigns but encourages everybody to actually get out there and vote! So, today just as people are being all serious and demanding in response to such a serious election, Bey brings some light to the situation. She posted this picture of her ballot and her duckface on her tumblr. It's a reminder that even in such tense times, we can lighten up a little bit and just enjoy the process of having a say in who leads our country! Bey is so cute!! Make sure you all get out and vote today! 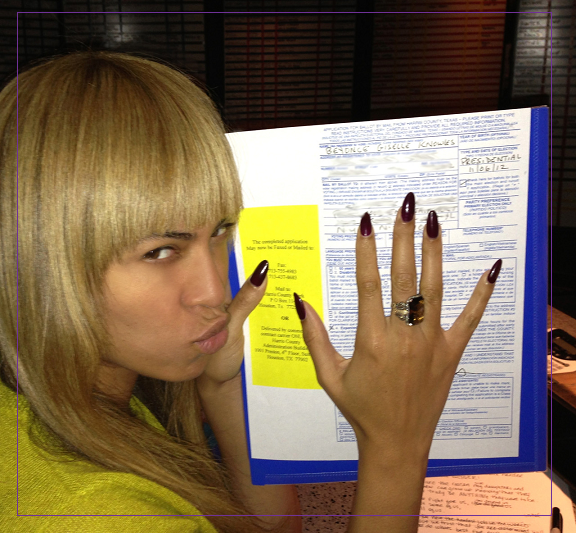 P.S.- Bey and I have the same nails right now.